Last month, Naresh Goyal and his wife Anita Goyal stepped down from the board of the airline. 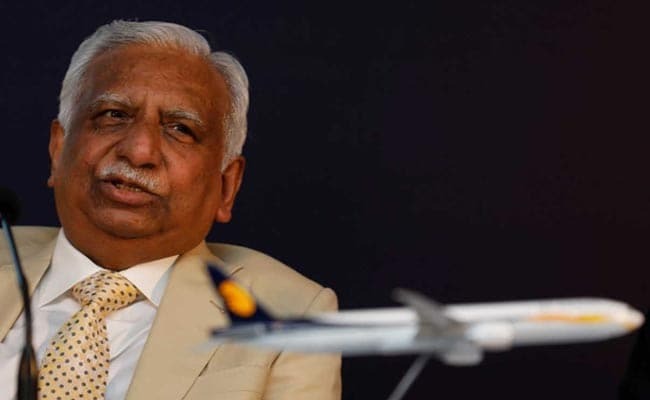 Mumbai: Jet Airways founder Naresh Goyal has decided not to bid for acquiring a stake in the cash-strapped airline. The decision by Mr Goyal, who along with his wife Anita stepped down from the airline's board last month, comes at a time the debt-ridden airline is struggling to stay afloat, and owes vast sums to lessors, suppliers, pilots and oil companies. The airline's board is meeting in Mumbai today. The government has asked the secretary of the Ministry of Civil Aviation to review the issues ailing the full-service carrier. Meanwhile, sources have told NDTV that the banks have offered a daily funding plan for Jet to remain afloat against Jet management's request to release Rs 1,500 crore at one go. "SBI is working on the emergency funding, everything is under discussion, nothing is finalised," state-run PNB's Mr Mehta added. Stock exchange BSE sought clarification from the airline on Tuesday after reports said the airline was likely to shut down its operations temporarily. A response from Jet Airways was awaited. Union Minister Suresh Prabhu said that Pradeep Singh Kharola would review the issues ailing the airline, especially increasing fares and flight cancellations. He said Mr Kharola had been asked to "take necessary steps to protect passenger rights and safety" and work with the stakeholders for their well-being. A government official told media the funding for the airline was likely to come through and that the banks were not looking to take the airline to bankruptcy court, news agency Reuters reported. Jet Airways needs an immediate fund infusion to get its planes back in the air and restore some of its key sectors to start generating revenue. On Monday, the lenders did not take a final decision on providing emergency funds to the carrier. On the same day, the airline's pilots gathered at Mumbai headquarters hoping for the revival of the private airline. The airline's group of lenders, led by State Bank of India, want a new investor to buy a stake of up to 75 per cent in Jet and initial expressions of interest were submitted last week. Struggling with a debt of more than Rs 8,000 crore, the airline has suspended its international operations for the time being. It has been losing planes in recent weeks as lessors scramble to de-register and take back their aircraft, even as the lenders have sought expressions of interest in the carrier from potential investors. Jet currently has roughly 44 flights, and only about seven operational planes, a senior pilot with the airline and a member of the National Aviator's Guild - a trade union of the airline's pilots - told Reuters on Monday. Shares in Jet Airways ended 7.72 per cent lower on Tuesday, underperforming the markets that logged record closing highs.